So a few weeks ago, me and Luca went for some brunch at a one off restaurant called The Gutsy Goose which is in Cathays, Cardiff. We had heard good things from Luca's sister so we thought we should give it a try. The Gutsy Goose has a wide variety of food, from steak to risotto and sunday lunch. 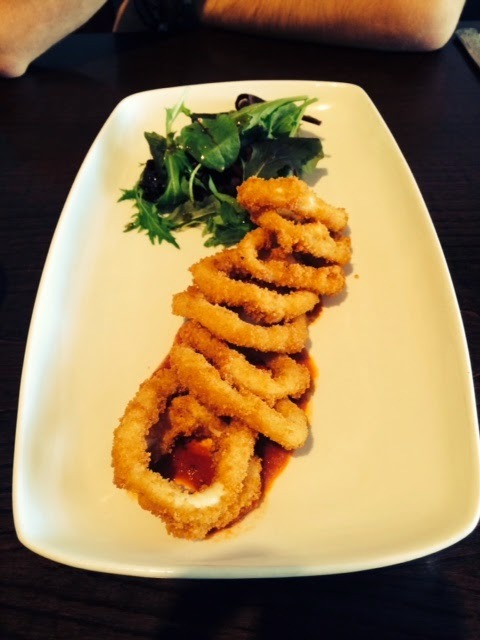 That day me and Luca both fancied fish, so for starter we ordered 'Breaded Calamari with a Spicy Tomato Sauce'. This was the first time I had ever tried Calamari. I've never been that keen on fish, but the last two years or so, I have started to really enjoy eating fish. And I can honestly say it was one of the nicest starters i've ever eaten. The sauce was also amazing!! 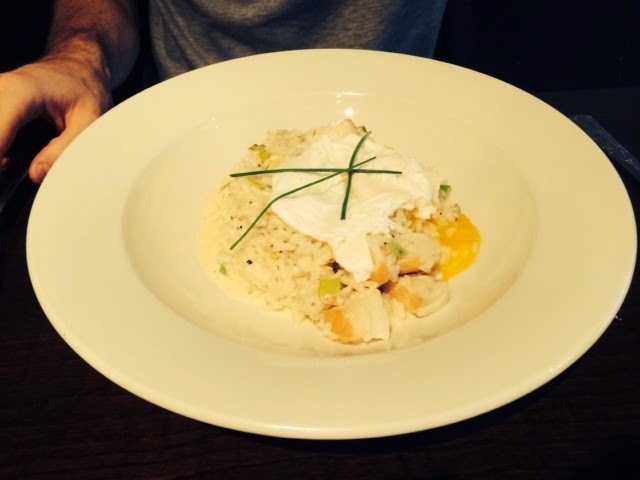 This was Luca's brunch, he had the 'Smoked Haddock Risotto, Topped With A Poached Egg'. He really enjoyed it, although his came a while after mine which is annoying. He kept telling me how nice the haddock was, so I tried some and it really was cooked so well! This is my brunch, I opted for the 'Homemade Salmon & Haddock Fishcake, Served With Chorizo Sausage, Hollandaise Sauce and Sea Salted Fries'. When I got given my meal, I was really confused as to why my fishcake had an egg on it. I'm not a fan of Chorizo or Hollandaise sauce, so was very quick to remove that. The fishcake itself was really lovely and jam packed with fish which was good to see as you don't usually get a lot of fish in a fishcake. The chips were also amazing, so nice that Luca kept stealing them off of my plate. Overall, I was really impressed with the food at Gutsy Goose, it was really well cooked and served so nicely. The only thing that let our meal down that day was the service. It could have just been a one time thing, but we seemed to wait for ages to get served when we could see the staff standing in our view just chatting. 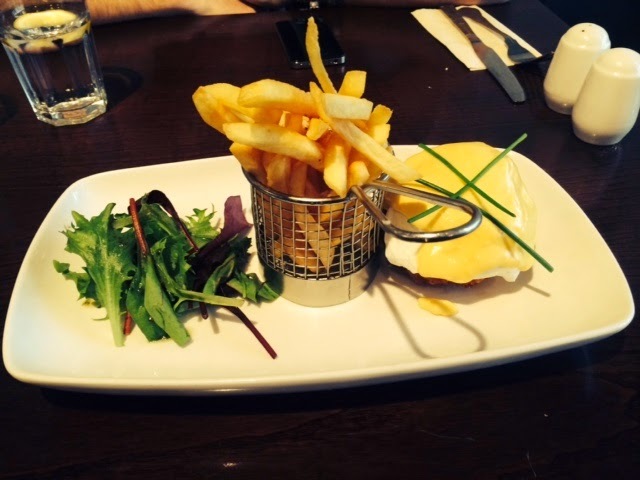 This did let it down as service is a big part of the enjoyment of your meal out. If you are looking to go somewhere with really nice food, then I can honestly recommend the Gutsy Goose.